With a long history of innovation Sharps Rifle Company (SRC) has done it again. After developing the most technologically advanced AR-15/M16/M4 bolt in the world, Sharps has developed a bolt carrier unit to complement it. 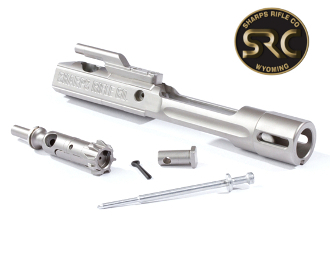 SRC began by identifying what the shortcomings with the traditional AR-15/M16/M4 bolt carrier. SRC identified two primary issues. The first being the rotational camming of the carrier during the unlocking portion of the operational cycle. The second being the canting of the bolt carrier group upon firing due to the gas pressure exerted to the gas key which naturally causes the front of the bolt carrier group to rise and the rear of the bolt carrier group to be pressed downward during its rearward travel. Armed with this knowledge, SRC's team of innovative engineers set about to correct those shortcomings. They used computer design technology coupled with real world testing to address both of these issues. When the process was completed, SRC sent the resulting prototypes to a broad spectrum of professionals who use their rifles hard for their personal evaluation and feedback. Their observations were then incorporated into the final design resulting in the new SRC Balanced Bolt Carrier (BBC). The Bolt Carrier is finished inside and out with NP3 PLUS to minimize the need for lubricants, to aid in smooth operation and to make clean up a breeze. The SRC BBC has the SRC logo machine cut on the side of the carrier which is visible when the ejection port door is open. S7 steel provides a 75% increase in tensile strength, and nearly 60% improvement in yield strength over Carpenter 158 steel.